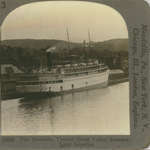 The "C. R. Chisholm & Bros. Montreal" is stamped into the reverse. "49 Moonlight on the Cedar Rapids of the St. Lawrence River" "Copyright 1902 by Underwood & Underwood" "Underwood & Underwood Publishers, New York, London, Toronto - Canada, Ottawa - Kansas" "Works and Studios Orlington, N.J. Littleton, N.H. Washington, D. C."
Reverse: "No 84858 Wreck of the Steamber L. Renaud in the Lachine Rapids, near Montreal, May 12, 1873"
"45. The Roosevelt leaving Chicago for holiday trip." "Copyright, 1909, by Stereo-Travel Co." "Stereo Travel Co. Corona, New York City"